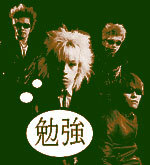 Members: Kiyoharu (vocals), Sakashita Taketomo (guitar), Kobayashi Masaru (bass), Mitsuzon Eiji (drums). Age: Kiyoharu - 10/30/1968, Sakashita - 03/08/1968, Kobayashi - 12/09/1967, Mitsuzon - 04/14/1968. SADS vocalist Kiyoharu came out of the group Kuroyume just before forming SADS. Kuroyume had started as somewhat of a heavy metal group, but then had pretty much moved away from it by the end. Kiyoharu wanted to go back to heavy metal. SADS has always stayed fairly true to that. After the release of their single in June 2003, "Masquerade", SADS paused activities. Kiyoharu has since been continuing on with his noteably non-heavy metal solo activities. Bloodtypes: Kiyoharu - A, Sakashita - A, Kobayashi - O, Mitsuzon - A.